The casino software developer Betsoft has once again raised the bar when it comes to the aesthetics of the game. 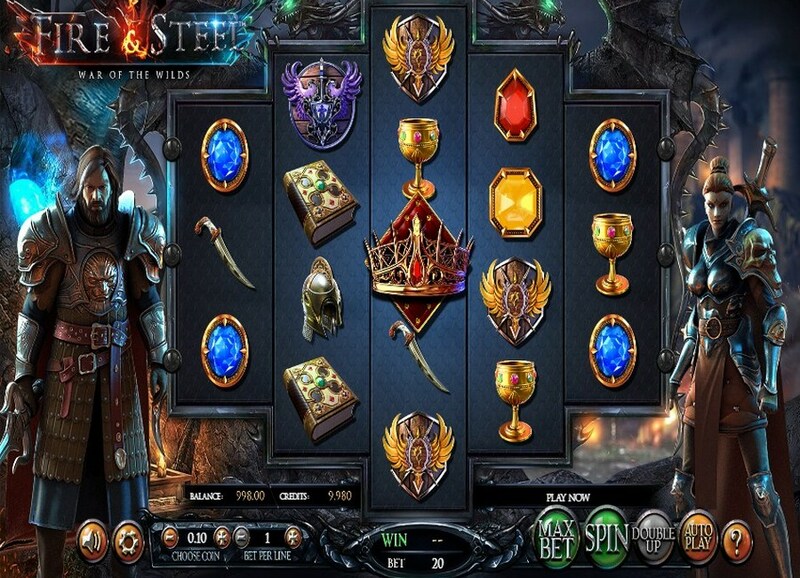 Their video slot game Fire & Steel launched in July 2017 is played at the 3x4x5x4x3 reels forming the shape of diamond and features impressive 3D graphics and outstanding animations. 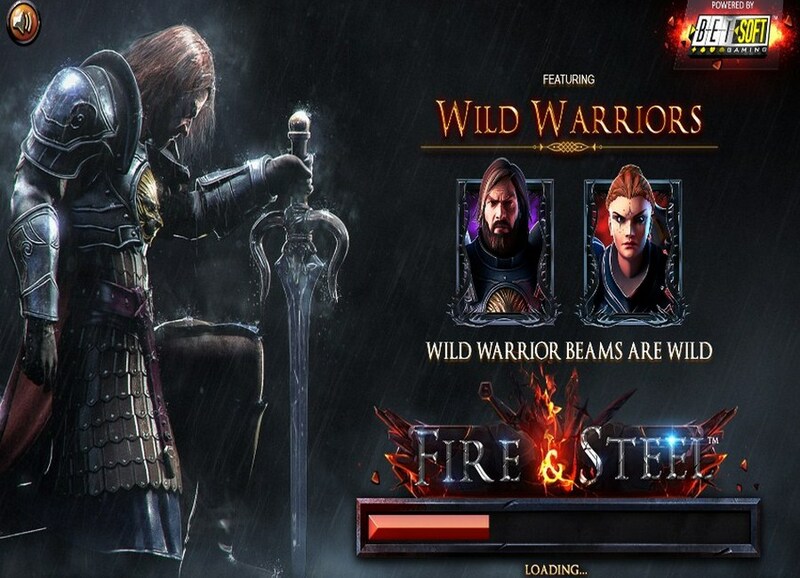 Recognised for the artistic style they use in their slot releases, people behind Betsoft have created a story that revolves around two warriors, a male and female. 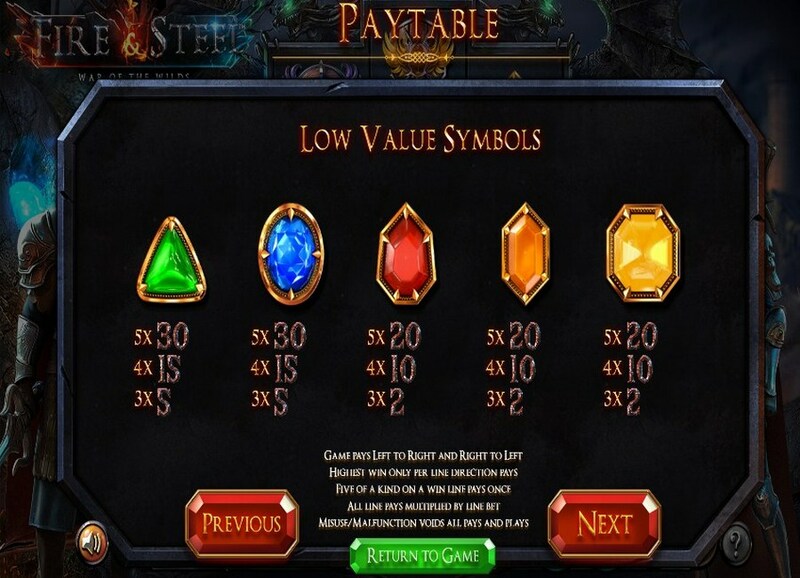 They will battle on the reels and help you win more with magical beams turning regular slots symbols into Wilds. The reels set against a night scene with dragons are populated with theme-related symbols of slot and a collection of jewels. The game pays both ways and benefits from expanding Wilds and free spins that can be retriggered. Using 5 reels and 20 fixed paying lines, Fire & Steel offers you to bet up to 5 coins per line. Adjust the coin size according your bankroll by picking a value between R0.20 and R10. Your total stake can be anywhere between R4 and R1,000. The standard Betsoft control panel offers the Spin, Max Bet and Autoplay buttons helping you to spin the reels the way you prefer to. The Max Bet allows you to set the bet to the maximum coin amount and spin the reels at the same time. If you don't feel like spinning the reels manually, use the Autoplay feature. You will hit wins as long as you land three or more matching symbols consecutively on a winning line left to right and vice versa. There are three sets of regular symbols, high, medium and low paying. They are depicted as crowns, shields, books, chalices, helmet, knives and loads of jewels. There are two wild symbols at play here namely the Swordsman and the Shieldmaiden. The Swordsman wild releases a vertical beam, either above or below him turning every symbol in his path wild. The Shieldmaiden on the other hand releases a magical horizontal beam which turns symbols to her left and right into wilds. Of the 2 wilds I prefer the latter one because it offers the best payouts by a long shot. The free spins feature that awards 10 free spins is unlocked when the Swordsman and Shieldmaiden’s beams intersect. The place on the reels where their beams intersected will be held as a wild for the duration of the free spins. Should the Swordsman and Shieldmaiden’s intersect on the reels again, the free spins will be re-triggered awarding another 10 free spins making it 20 in total. It took me 59 spins at an average bet of $5 per spin to trigger the free spins mode. The fantasy-themed online video slot game from casino software provider Betsoft will provide you a cinematic gaming experience whether you play it on your computer, tablet or smartphone. Feel Fire & Steel in all its greatness and start creating winning combinations both ways with two brave Warriors boosting your winning chances. The slot machine game is worth playing both for its visual appearance and innovative and rewarding bonus features, so start spinning the reels and enjoy some epic casino action wherever you are.